Quantitative mapping of metabolite distribution has widespread applications in medicine and biology, but has remained a key analytical challenge. A novel method for sugar imaging in plants based on the principles of infrared spectroscopy, which was developed at the IPK-Gatersleben, allows the quantitative visualization of sucrose at a microscopic level of resolution. It successfully modeled the sugar concentration in individual vascular bundles and within complex organs. The capacity of the method to characterize the heterogeneity in the metabolism of a complex organ opens novel avenues for analyzing the inner life of plants. Plants transport assimilate largely in the form of sucrose . In addition to its primary role as an energy source, sucrose is also used as a signal in various adaptive and stress responses. Thus an ability to quantify sucrose over time and space would serve to progress our understanding of these important processes. Current technologies in use for sucrose mapping are inadequate where there is a need to quantitatively visualize its distribution within tissue. Powerful technologies such as mass spectrometry  and positron emission tomography  have so far been unable to demonstrate a sufficient level of chemical or spatial resolution when targeted to sucrose. Nuclear magnetic resonance is able to measure sucrose in a label-free manner in vivo, but is challenged when sucrose present at a low concentration . The fluorescence resonance energy transfer method in principle provides a high level of resolution , but its practicability in the crop context is questionable given the need to genetically transform the plant. Finally, quantitative bioluminescence and single photon imaging, which provided the first visualization of sucrose gradients in tissues, is disadvantaged by not supporting a reasonable sample throughput . Fourier-transform infrared (FTIR) spectroscopy has found widespread application in medical research, bacteriology, plant breeding and food science, but has not to date been extended to image sucrose or any other relevant sugar. 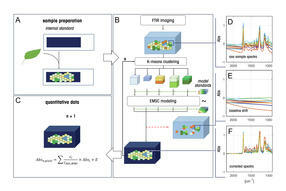 Its exploitation for the quantitative analysis of tissue sections is limited mainly by the complexity of the resulting spectral matrix, which obscures specific metabolite signatures and therefore requires an algorithmic decomposition to recover a given compound-specific signal. In addition, means to standardize the analytical procedure and to reproduce the data quantitatively are lacking. To overcome these limitations, we developed novel algorithms with internal and external standardization. The novel imaging procedure allows the quantitative visualization of the distribution of sucrose within heterogeneous plant tissues at a resolution of about 12 µm and a detection range of 20 to 1000 mM. Fig. 1 Schematic overview of the method used to acquire and analyze FTIR spectra. (A-C) main steps for imaging and standardization; (D) sample raw spectra from tissue sections, illustrating variation in the baseline; (E) modeled baseline artifacts after four rounds of baseline correction; (F) baseline-corrected spectra revealing the chemical fingerprint of the sample and the internal standard. Absn,pixel: normalized pixel absorbance, ci: coefficient of compound i, cAbs,MMI: coeffi-cient of membrane, Absi: spectrum derived from purified compound i, E: noise. The procedure was recently described in detail  and is schematically presented in Figure 1. The tissue cryosections is placed on a membrane to support the tissue and, at the same time, to catch its unique spectral fingerprint. The latter provides an internal standard for the procedure and its reliability could be experimentally verified. The strong baseline shifts comprised in the raw spectral data are extracted using a baseline correction algorithm. 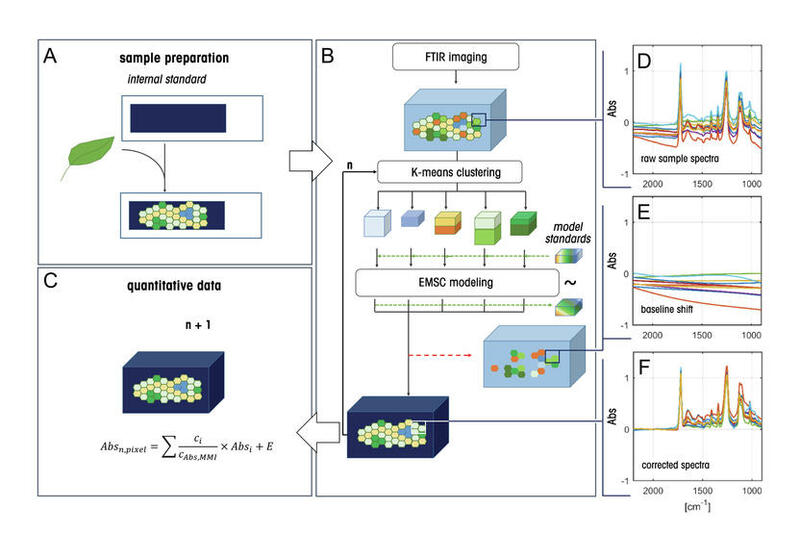 To achieve this, the spectral cube is sub-divided into smaller pieces via K-means clustering. 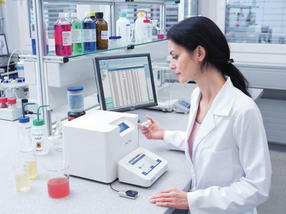 A data set derived from the spectra generated from relevant pure analytes (i.e., the external standards) is then added to each piece. After subsequent modeling, the standards are compared with their unprocessed counterparts, allowing the model to be fitted. The procedure generates a coefficient matrix which describes the composition of each sample spectrum from the modeled features. In order to quantitatively compare these features across different samples, the matrix coefficients are normalized against the internal standard. Initially, an in silico data set was calculated for pure sucrose and embedded into a mix spectra matrix constructed from a number of random standards – this was then used to test the effectiveness of the feature extraction procedure.The resulting sucrose-specific images were reproduced with an R² value of >0.9; there was hardly any interference with the spectra generated from the other compounds present in the matrix. The experimental data and the calculated signal intensities were clearly linearly correlated. Next, a sucrose dilution series was established to estimate the correlation between known concentrations and absorbance values: this indicated a high level of confidence as measured by the R² parameter (>0.98) and the RMSEP (0.036 pg/µm²). Finally, tissue previously imaged by FTIR was laser-dissected and the resulting fractions analyzed for their sucrose content by ion chromatography. The modeled and the experimental datasets were significantly correlated (R²>0.98) again. The conclusion was that our FTIR procedure accurately displays the sucrose distribution in a quantitative manner. Fig. 2 Quantitative maps of sucrose and starch distribution in cereal grain. Concentrations are color-coded with red (blue) indicating maximum (minimum) levels of the presented metabolites with quantitative data presented in the height of the Z-profile of the images. We tested the capacity of the new method to visualize sucrose distribution in the cereal crops barley and wheat, and the model plant Arabidopsis. The sucrose visualization is exemplified here for the young cereal grain at the main filling stage. 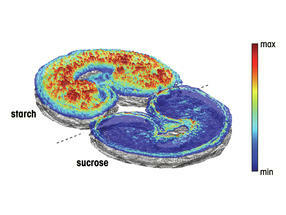 The sucrose map in Figure 2 featured a marked gradient across the grain. High concentrations were associated with the ventral part of the grain, where sucrose is delivered by the major vascular bundle. The profile accorded well with what had been revealed by 13C/1H NMR imaging regarding the location of the main sucrose translocation pathway . In the FTIR images, the highest concentrations were found within the endosperm transfer cells (ETC), which are capable of actively taking up sucrose against a concentration gradient. A rather shallow gradient was found from the ETC towards the peripheral endosperm, where sucrose is converted into starch – the major storage compound in the cereal grain. We conclude that the FTIR platform can image the distribution of sucrose at the cell-type level of resolution and can generate a sucrose map which reflects the allocation process occurring within the grain. Notably, our imaging approach can be broadened to cover a range of other metabolites, as exemplified by its use for starch imaging (Fig. 2). FTIR demonstrates where starch is accumulated within the grain, namely in the endosperm. The quantitative analysis of starch distribution is informative for biotechnological improvements of grain yield and quality. The major achievement of our approach is to permit a component-specific and standardized analysis of sucrose distribution in a complex biological sample. Imaging is marker-free and applicable to any tissue. Its chemical and spatial resolution is sufficient to quantify sucrose in individual cell types within a plant organ, for example allowing phloem sucrose levels to become readily measurable under any growing conditions. Its application to crop and model plants highlights the potential of the method for resolving the spatial distribution of metabolites and photosynthate allocation, both being relevant for plant breeders in their attempt to establish high-yield crops. The FTIR procedure relies on available instrumentation and materials, and so can be established in any laboratory. As its application is not limited to sucrose imaging, we see widespread future application in applied and fundamental research. We acknowledge S. Wagner, Dr. A. Muszynska and S. Herrmann for valuable contributions. This work was supported by DFG (Grant BO 1917-1). The Leibniz Institute of Plant Genetics and Crop Plant Research (IPK) is a nonprofit research institution, a member of the Leibniz Association, and one of the world's leading international institutions in the field of plant genetics and crop science. Its research program and services contribute materially to conserving, exploring and exploiting crop diversity. The research group Assimilate Allocation and NMR (AAN) is part of the department Molecular Genetics (Head Prof. Dr. T. Altmann), and is dedicated towards a better understanding of the relationships between assimilate supply, metabolism and seed architecture, thereby uncovering mechanisms for improved traits in major crop plants.